> I know I have referred a lot to the school garden that I manage. But I have to make a change because I have (quite insanely, as my husband points out) agreed to help out with the gardens being started at my older child’s elementary school . So, today I wanted to show how the preschool garden, as it will hereafter be known, has really been revived by the short spell of rain and cooler temps. Which should return tomorrow after a few unbearable hot and humid days this last week. Yay! First, this is an overall photo of the 6′ x 12′ bed in which the veggies are growing. You can see the fall crop of squash in the foreground. 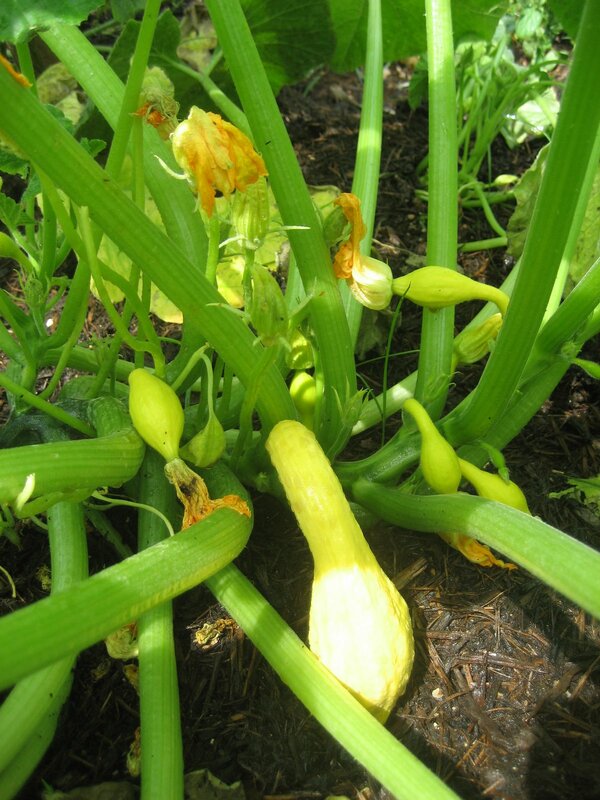 We have crookneck and eight ball squash here. 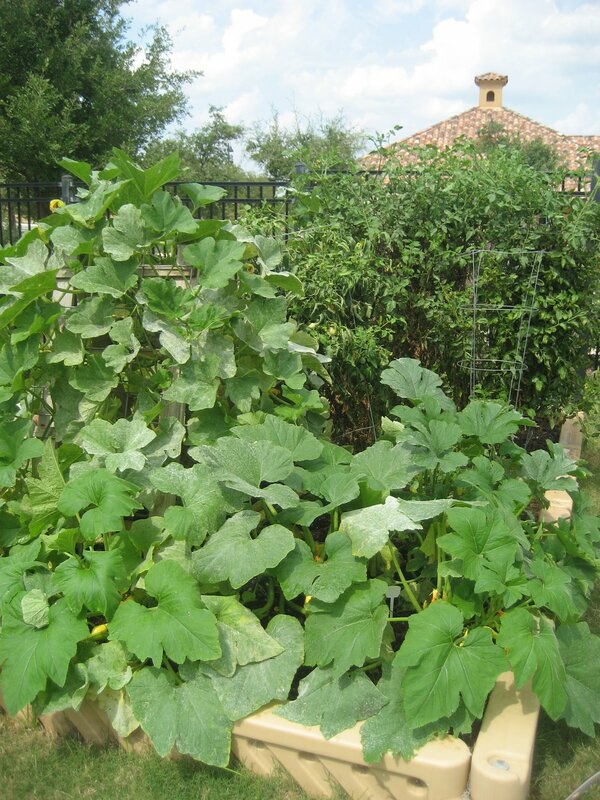 To the left side are the pumpkins growing on our homemade trellises that were previously used for cucumbers. You can on both of these that we have a smattering of powdery mildew. I had been hoping it would resolve on its own if I removed affected leaves, but no such luck. I am going to use a home remedy tomorrow of diluted cider vinegar. Apparently it changes the pH and inhibits the mildew. I’ll report back on its success. In the rear, you can see the tomatoes. These have been going since spring. I cut them back by half in August and they just instantly started growing like crazy. I removed two out of six that were not recovering from the drought and propagated two new tomato plants by layering branches from the healthy plants down under the soil until they sprouted roots. 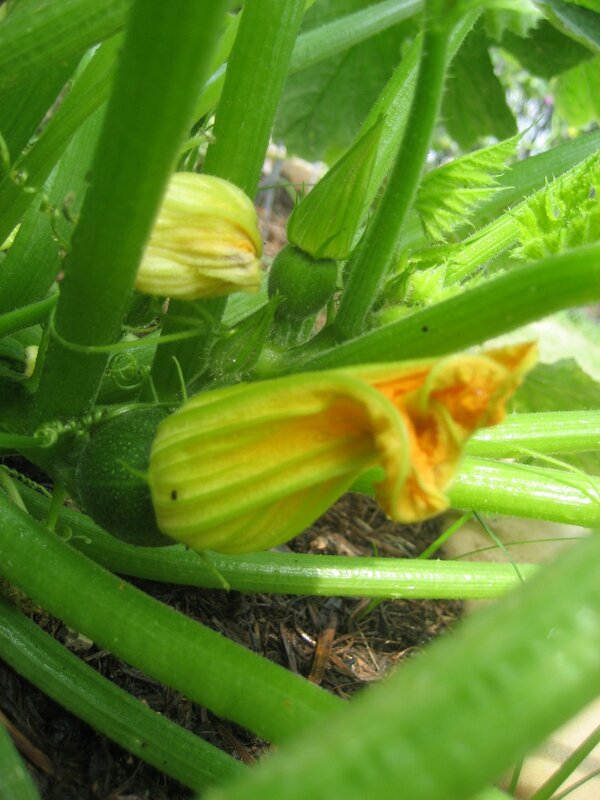 Here is one of the crookneck squash plants. Seems to be putting on squash pretty successfully, I did have to come up and perform some surgery on these a few weeks ago when I discovered borer holes, despite my gleefully squashing eggs between my fingernails every day when I found them. Some of them slipped by and chomped right into the stems. I cut four out and buried the sliced-open stems under more soil to encourage rooting. I harvested two crookneck squash today and gave them to the cook who announced she would be pureeing them into the spaghetti sauce later in the week. I love it! 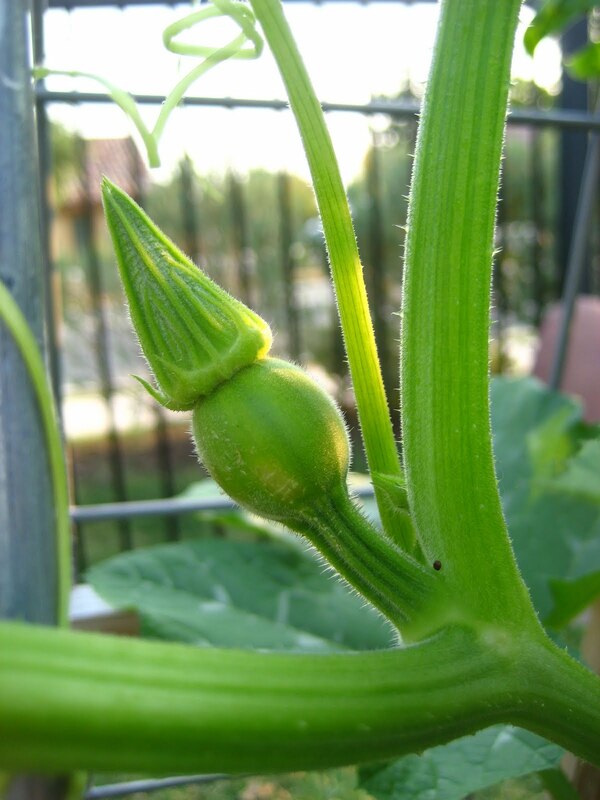 We are also growing eight-ball squash. My first time to do it and the shape is just so cool. 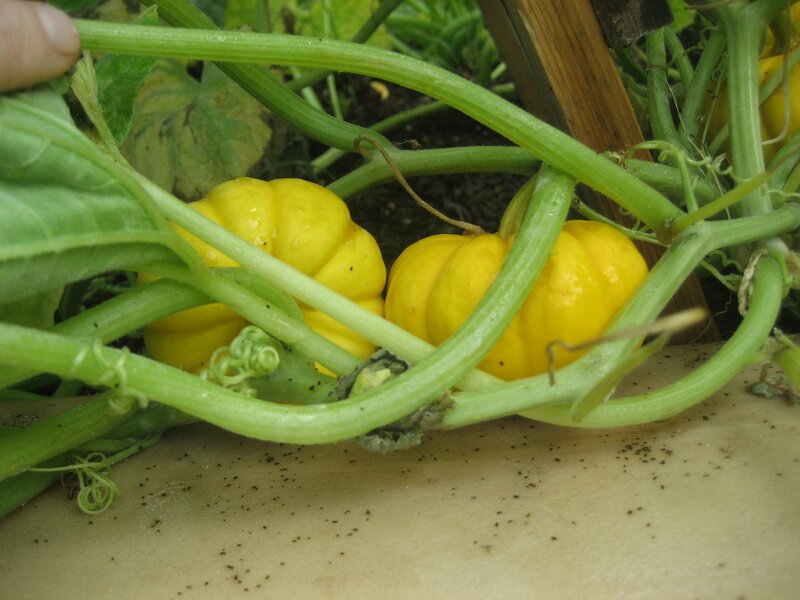 We have one pant that is producing green ball squash and one that is producing yellow. I brought a green home today to try so I could give a description to the cook. Diced and sauteed it and topped it with tomatoes and mozzarella cheese. Yum! Plus they are really cute. And finally the pumpkins. Again, I have been fighting borers and powdery mildew which have taken their toll. I pulled one small plant up today who just couldn’t keep up the fight. But my other plants are going gangbusters, climbing over the trellises and under the tomato plants, actually using the tomatoes as a trellis in some cases. And here you can see a few of the pumpkins. They are all baby size pumpkins, as we don’t have the room for the big mama pumpkins. Let’s hope I can manage the powdery mildew and keep these lovelies alive until Halloween! >Sunday was museum day in Austin where the museums had free admission. We took advantage by taking the kids to see the Wildflower Center. I started taking pictures upon arriving but Jack kept asking to take some as well. I thought to myself how Jack will have a totally different perspective on the Wildflower Center and it would be interesting to see what catches a 5 year old’s eye. Give a little leeway for the fascination a 5 year old can have with taking pictures of his feet. But without further ado, here it is. 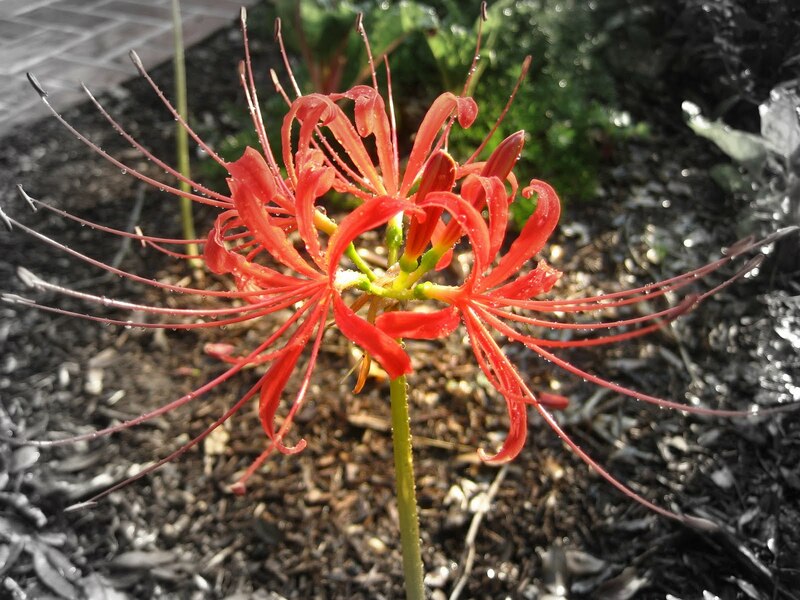 >Have you been thinking of redesigning your garden or creating a new planting bed? Attend the Travis County Master Gardener free seminar on landscape design and learn the basics of good landscape design practices. This seminar will help you learn how to analyze your needs, formulate a concept plan and transform all of it into a final planting plan. >Just sitting here listening to the first raindrops hit our metal roof…and it is a glorious sound. Amazing to finally have some regular rainfall happening. Enough to make the watering restrictions not such a death sentence. >School garden is producing again! In the picture, you see tomatoes on the back right, pumpkins on the left of the garden (on the trellises) and yellow crookneck and ball squash growing in the right foreground. I noticed the tomatoes I have cut back are really putting on growth and probably 3 out of the 5 have flowers again. The cherry tomato already has fruits again which have been ripening so we’re back on track. We did lose one tomato plant after cut back, but I bent down one of the branches on an adjacent plant and layers it to create a new plant. Yea, free plant! 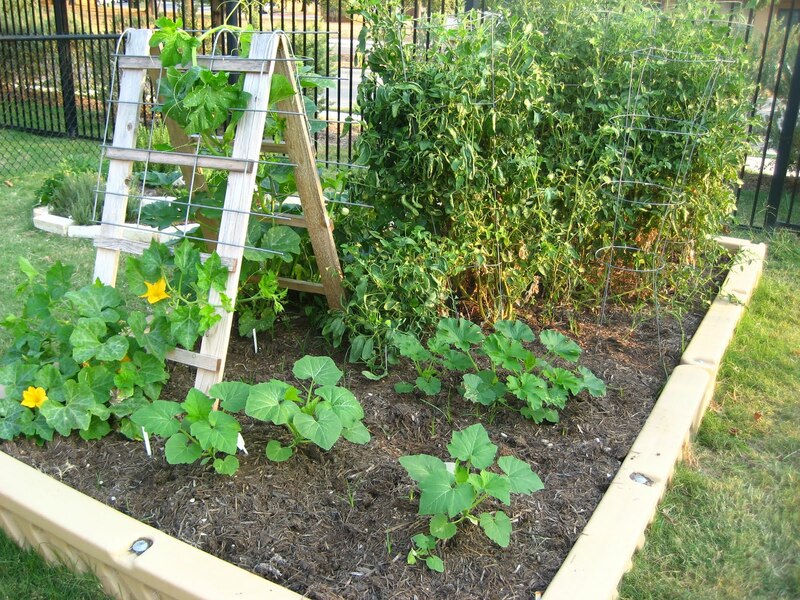 The baby pumpkins are doing great, climbing all over the trellises we previously used for the cucumbers. The challenge will be to give them enough space once they really get going. I caught this picture of a tiny pumpkin- that was one day ago and I saw the flower is open today with bees all inside of it. But EEK! what I did not notice was the squash vine borer egg that is sitting in the crook of the stem. I’ll go hunt it down when I pick up Alex today. Nice to see it all recovering now that weather is in the 90s instead of the 100s. The kids are going out to water everyday, and even the 2 year old have been going out and taking little cups of water to pour on the plants! 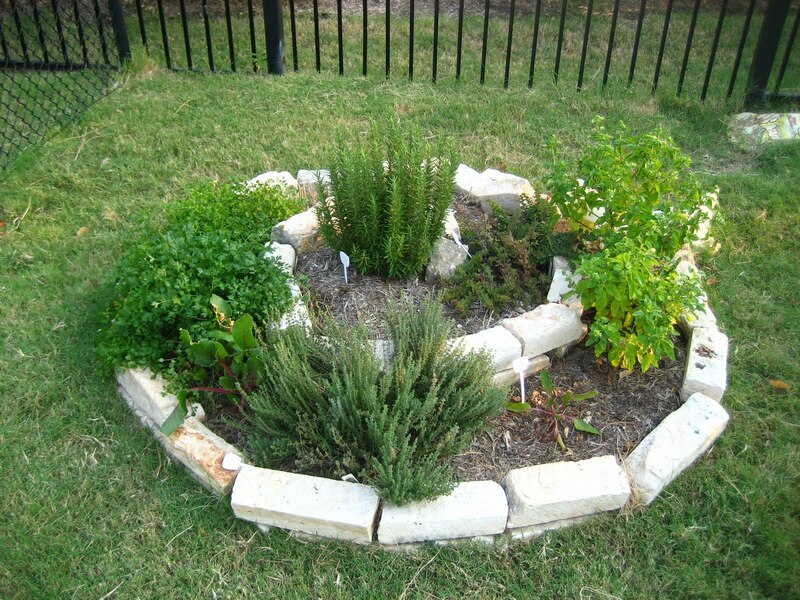 The herb spiral continues to do great and the school has had the strongest, longest-lasting crop of parsley that I have ever seen. Mine gave out eons ago. But they have parsley, oregano, basil, chard, and thyme all going strong. The only herb that did not last through the summer was the dill. I’m going to cut some herbs for the different classes so they can have a smellathon. Hoping for a crop of squash and tomatoes and then the plan is to clear and make way for spinach. My hope is to get approval to install a drip system this winter and a cattle panel trellis to bend from one side to the other. >#68…but will Fall deprive us of the record? >Today should be our 68th day of 100+ temperatures here in Austin. The record is 69. Is it wrong that I kind of want two more days of excessive heat just so we have the bragging rights to holding the record for most 100+ days in a year?